OneAZ Credit Union was founded in 1951. We are a leading organization trusted by over 143,000 members. We have $2 billion in assets and 22 branches throughout the state. Our dedicated team is passionate and works hard to help our members achieve their financial goals. We offer competitive loan rates, checking accounts for both personal and business needs and a variety of savings plans. We continue to support and invest in our communities, and our mission is to improve the lives of our members, our associates and the communities we serve. We are proud that 70 percent of OneAZ Credit Union associates are women. “I was 9 years old when my father and I made a trip to the bank in his blue station wagon. He was there to make a mortgage payment as a first-time homeowner in America. I was there to dream. Years later, I proudly took him into the same bank, where I was a manager. Throughout my parents’ life in the United States, they had great people who helped them achieve their financial goals: the real estate agent, the banker and the insurance agent. Watching these people support my parents is why I am passionate about helping my community and the members at OneAZ Credit Union. Laura serves as the Executive Vice President of Retail Sales for OneAZ Credit Union. A graduate of Western Carolina University, she previously served in leadership for Wells Fargo for over 16 years. Laura is very passionate about being involved and giving back to the community she calls home, having worked with Habitat for Humanity, March of Dimes, Sweet Dreams in a Bag and Denver Rescue Mission while living and working in Denver, Colorado. 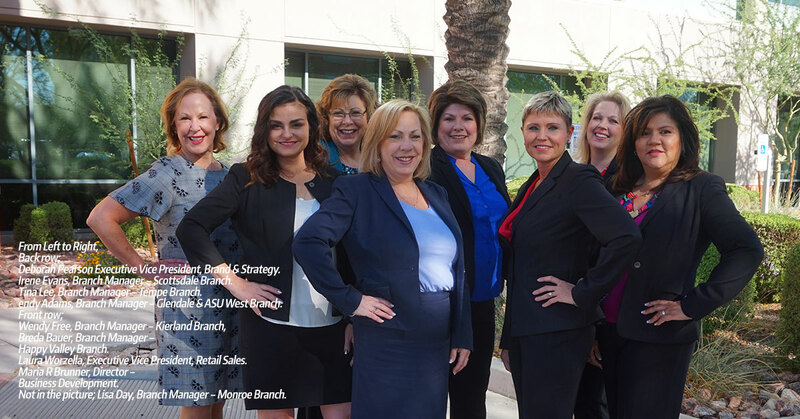 A financial services industry veteran of over 25 years, Deborah currently serves as the Executive Vice President of Brand and Strategy for OneAZ Credit Union. She leads several key teams, including brand, marketing, communication, member experience and the Member Care Center. These teams ensure that OneAZ members always have an easy, enjoyable and effective experience. Throughout her career, Pearson has led dozens of growth initiatives for five multi-billion-dollar financial services organizations. Pearson holds a bachelor’s degree from South Dakota State University and a master’s degree from the University of South Dakota.